TELEPHONE ORDERING ONLY. Engine Assembly New Unit. 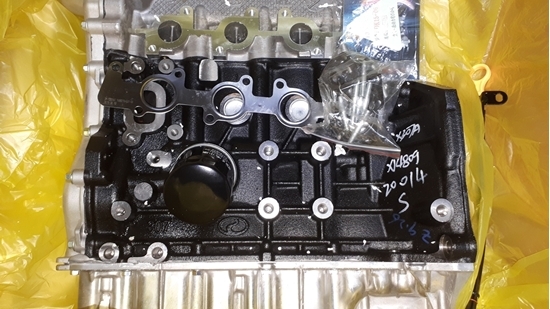 (Without Ancillaries) Supplied with Oil Filter And All Necessary Gaskets. Fits DFSK "C" Series Models With 1500cc Engine Code DK15-06. IMPORTANT:- 12 MONTHS PARTS WARRANTY ON THIS ITEM.WITHIN 14 DAYS YOU WILL NEED TO SEND/EMAIL US A COPY OF ENGINE FITMENT INVOICE SHOWING VEHICLE REGISTRATION NUMBER AND MILEAGE. IN THE EVENT OF A WARRANTY ISSUE YOU WILL BE REQUIRIED TO PROVIDE US WITH DOCUMENTS RELATING TO VEHICLE SERVICE INVOICING AS PER MANUFACTURES SCHEDULE WITH THE EXCEPTION OF OIL AND FILTER CHANGES. WE RECOMMEND OIL AND FILTER CHANGES ON GENERAL USE VEHICLES EVERY 6000 MILES AND 4000 MILES ON DELIVERY/CATERING VEHICLES. WARRANTY IS VOID IF THERE IS EVIDENCE OF ENGINE RUNNING AT ABOVE NORMAL TEMPERATURE CONDITIONS AND NON ORGANIC ANTI-FREEZE HAS BEEN USED. WE RECOMMEND THAT ORGANIC ANTI-FREEZE TO BE USED WITHIN THE COOLING SYSTEM.FAILURE TO DO SO MAY RESULT IN PREMATURE COOLING SYSTEM COMPONANT FAILURE. DO NOT MIX ORGANIC AND NON ORGANIC TOGETHER.